(A.A. Hébrard, Paris); sold c. 1921 to (Walter Halvorsen), apparently for sale in New York; sold or possibly consigned to (Durand-Ruel Galleries, New York), by 1922; possibly consigned 1923 to (Leicester Galleries, London); possibly consigned 1923 to (Casa Editrice d'Arte Enzo Pinci, Rome); possibly consigned 1924 to (Galeries Georges Petit, Paris); sold or possibly consigned 1925 to (Ferargil Galleries, New York); sold 1926 to Jules E. Mastbaum [1872-1926], Philadelphia. Lessing J. Rosenwald [1891-1979], Jenkintown, Pennsylvania; by inheritance (or possibly a gift) to his wife, Edith G. Rosenwald [1893-1988], Jenkintown, Pennsylvania; gift 1989 to NGA. According to the archives of the Hébrard foundry, cited in Anne Pingeot, Degas Sculptures, Paris, 1991: no. 48 and "Repartition des bronzes avant 1936" on p. 196. See also Joseph S. Czestochowski and Anne Pingeot, Degas Sculptures. Catalogue Raisonné of the Bronzes, Memphis, 2002: 163. See Caroline Durand-Ruel Godfroy's account in Pingeot 1991, 31; Czestochowski and Pingeot 2002, 17-18, 163. 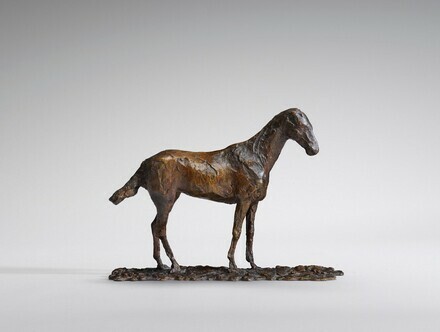 This bronze is one of about twelve casts after Degas' sculpture that Mastbaum purchased before his death in December 1926, according to "List of sales, January 1926-March 30, 1936," in the Ferargil Galleries records, 1900-1963, Reel D322, frames 351-424, Archives of American Art, Washington, D.C. Cast numbers listed there do not correspond completely with those cited as purchased by Mastbaum in Czestochowski and Pingeot 2002, 163. Documentation about the Rosenwald acquisition has thus far not been found in either Lessing J. Rosenwald collection records in the NGA Archives or his papers in the Library of Congress, Washington, D.C.
Exhibition of Bronzes by Degas 1834-1917, Durand-Ruel Galleries, New York, 1922, no. 48, as Etude de cheval (les oreilles manquent). Possibly Exhibition of the Works in Sculpture of Edgar Degas, Leicester Galleries, London, 1923, no. 48. Possibly La Seconda Biennale Romana: Mostra Invernazionale di Belli Arti. Sculture di Edgar Degas 1834-1917, Casa Editrice d'Arte Enzo Pinci, Rome, 1923, no. 48 or no. 50 (different catalogues give different numbers), as Studio di cavallo. Possibly Exposition Degas, au profit de la Ligue franco-anglo-américaine contre le cancer: Peintures, pastels et dessins, sculptures, eaux-fortes, lithographies et monotypes, Galeries Georges Petit (sculpture shown at Galerie A.A. Hébrard), Paris, 1924, no. 301. Exhibition of the Works in Sculpture of Edgar Degas, 1834-1917, Ferargil Galleries, New York, 1925, no. 48, as Study of Horse. Degas at the Races, National Gallery of Art, Washington, D.C., 1998, no. 127, repro. Pingeot, Anne. Degas Sculptures. Paris, 1991: no. 48. Sculpture: An Illustrated Catalogue. National Gallery of Art, Washington, 1994: 69, repro. Campbell, Sara. "A Catalogue of Degas' Bronzes." Apollo 142 (August 1995): 10-48, no. 21. Czestochowski, Joseph S., and Anne Pingeot. Degas--Sculptures. Catalogue Raisonné of the Bronzes. Memphis, 2002: 163. Lindsay, Suzanne Glover, Daphne S. Barbour, and Shelley G. Sturman. Edgar Degas Sculpture. The Collections of the National Gallery of Art Systematic Catalogue. Washington, D.C., 2010: no. 1, 66-68, color repro.